Holy Matrimony is a sacrament that expresses the unbreakable bond between Christ and his people. 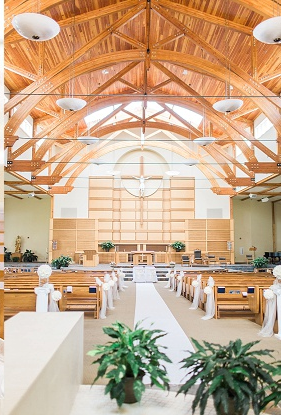 If you are interested in getting married at St. Joseph Catholic Church, you must receive at least six months of marriage prep prior to your desired wedding date. 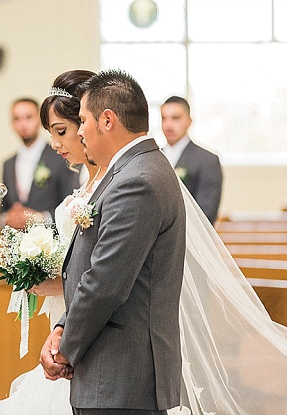 Those wishing to be married here at St. Joseph Catholic Church or to be prepared here for a wedding elsewhere, must attend ALL Marriage Prep classes scheduled on Mondays as followed: Please be mindful that this preparation series will be only offered once a year. Please register at the Parish Office during business hours Monday-Friday 9am—5pm or if you have any questions, please call 662-4569. Si ha pensado casarse aquí en la Iglesia Católica San José o quiere prepararse con nosotros para tener su boda en otra iglesia, entonces debe asistir a todas las clases de preparación matrimonial programadas.